Typically, rum that is fruit flavored is just un-aged alcohol with flavoring, coloring and sometimes a sweetener added. 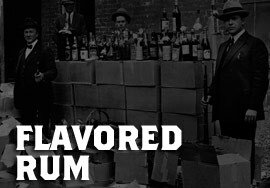 There are flavored rums available that are aged and use actual fruit and all natural flavors. As with anything, proper research will help you find the correct rum you are looking for.